Welcome to my first post of 2017! As of yesterday afternoon, I had been away from the city for over a week and I have to say, re-entry was pretty rough. Work today was a complete blur and I feel like the gears of my brain are slowly grinding to a slow beginning. Being at home with my family was magical and was made even better when we decided to do a Christmas brunch instead of the normal Christmas dinner. We made four different variations of strata, french toast casserole (with ham and maple syrup! ), eggnog waffles, fruit salad, smoked salmon and toast, and Bloody Mary's. This extravagant and delicious meal made me realize how not enthused I am about dinner-type foods and I have petitioned to my parents that we do a brunch every year moving forward. Good idea? I think so. That being said, I am excited that it is a new year and when 2016 was rounding out, I got to thinking about all the cool stuff that happened last year, including the most traveling I've ever done within the U.S. Seriously! I traveled to Atlanta, Nashville, Baltimore, Orlando, Los Angeles, Providence, Montana, Wyoming, San Francisco, Big Sur, and Charleston and they were each unique and lovely in their own way, and all involved lots of amazing food. I'm also back at a job that I love and I think that I did a pretty good job making time to work on this blog. Thank you to everyone who has been reading and following along! I'm excited for what 2017 holds in store. Speaking of breakfast, I wanted to kick this year off with something I eat normally for my favorite meal of the day. I'm a granola snob. I rarely ever eat boxed granola and prefer to make my own, or fall for the really expensive small-batch granola. Yes, I spent $20 on some amazing granola at Gjusta at Venice Beach and took it back to Brooklyn where I savored every last bite over the course of a month. This granola is like crack. It's cooked on very low heat for about one and a half hours, making it perfectly crunchy. Plus, I try to make it with not too much sugar so I don't think it's as unhealthy as what you find in the grocery store (don't quote me on that though). Preheat oven to 200 degrees F. Mix all of the ingredients into a large mixing bowl until evenly coated. Spread granola mixture on a parchment lined baking sheet and bake for 90 minutes, checking every so often to toss it around. Bake for 2 hours if you like it crunchier. When you remove it from the oven it will still be a bit soft, but will stiffen as it cools. 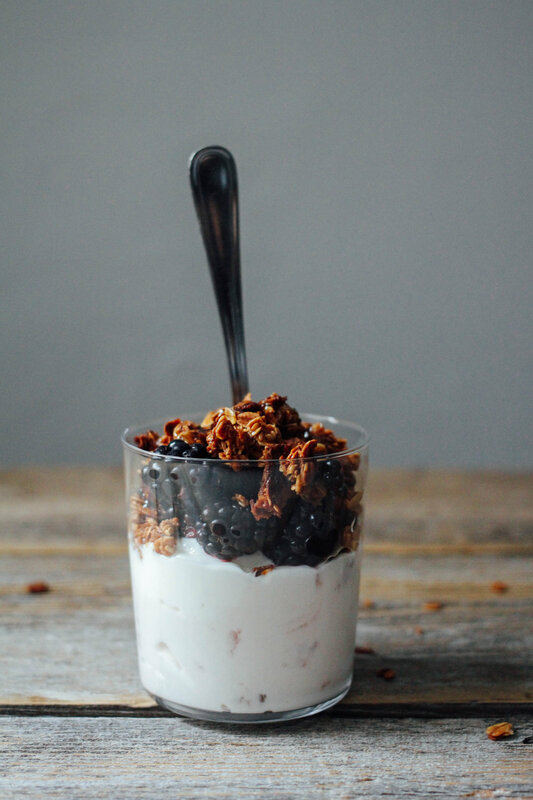 Once cooled, break granola up with your hands. Serve with yogurt and fruit. Keeps for a month in air-tight container.